...to keep you active, healthy and optimisitc during the winter! Winter offers lots of opportunities to stay active, strong, optimistic and fit. Through alternative cross-training activities, you add spice to your training in addition to your normal running, walking, cycling or swimming activity. Below, in no particular order, are our top 10 ideas. Cross-country skiing is a great way to enjoy the outdoors while getting a rigorous and feel-good workout. When you cross-country ski you use both your arms and legs which, in turn, develops a high level of aerobic fitness. There are lots of places to ski in Indiana. Many state and local parks and even some golf courses (check in at the club house) have great trails to ski on. To learn more about Cross-Country skiing in Indiana, check out XC Ski Indiana. The Runners Forum carries a wide variety of gloves, hats, and other apparel that can be used for running, walking, cycling, and cross-country skiing during the winter. Ice skating is a great addition to your normal exercise routine. And it’s fun! Like downhill skiing, ice skating will work your gluts, hips and core-areas we often ignore. There are several places in Indiana to ice skate. Check them out here. In many ways, how you handle the final two weeks leading up to your big race is just as important, if not more so, as the months you spent training for it. You will hear the word ‘taper’ thrown around this time of year. Taper refers to the rest period before your hardest effort, whether a triathlon, marathon, half marathon, or other distance race/event. Here are a few suggestions to guide you through this subtle, but vital stage of your race preparation. These simple suggestions will help ensure that race day is a celebratory culmination of the work you put in, and not a disappointing ride on the struggle bus. The cushioning system on a shoe is designed to absorb the impact of your body's force striking the ground, it does this by compressing under load andrebounding as you take the weight off the shoe. A typical person's foot will strike the ground approximately 1,600 times when walking or running a mile. Each foot strike requires the cushioning system to compress and rebound and after about 200 miles the cushioning system in most shoes has started to lose its resiliency. As the cushioning system wears, the body begins to absorb more of the impact force, this puts additional wear and tear on the joints, ligaments and tendons. Paying attention to the lifespan of your shoe's cushioning system is important to avoid an overuse injury and keep your body healthy so you can enjoy the lifetime benefits of an active and healthy lifestyle. There are several variables that could alter how long your shoe will last. For example, running on a soft surface such as a trail or treadmill will be easier on your shoes than running on hard surfaces such as roads or sidewalks. Also if you wear your shoes for exercise only they will last a lot longer. Alternating between two pairs of shoes is another good way to increase the life of the shoe. Most running shoes will last up to 500 miles. 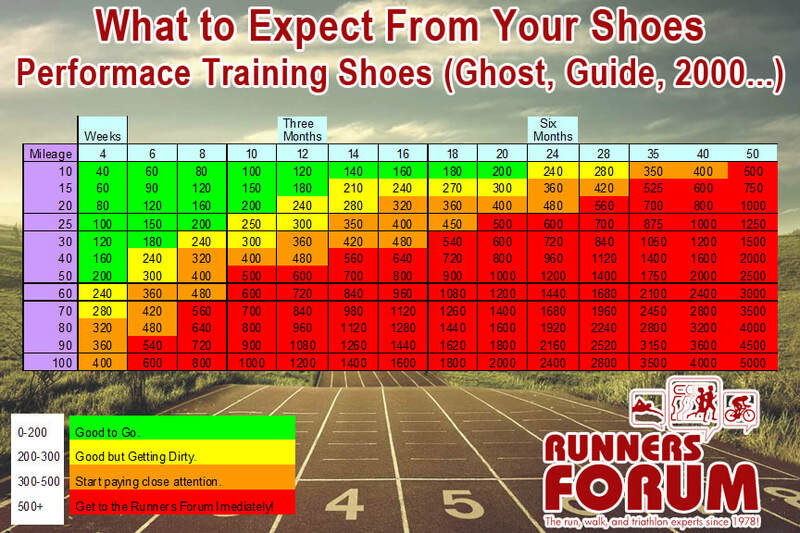 If you know on average what you typically run a week the chart below will help you figure out roughly when it will be time to invest in a new pair. Be sure to check with a member of our experienced staff to see what shoe best fits your unique foot! Whether you are a first timer or experienced half marathoner, you’ll benefit from fueling your body before and during your half marathon. Practicing your fueling plan during training will help ensure you know what your body needs and what works best to keep your muscles fueled for the duration of the event! We’ll help make sense of the options and provide advice to help you succeed on event day! Also, find advice and reviews here about shoes, gear, & nutrition from those who have put the gear to the test!